Picture this: It's Sunday morning and you've ducked out to fill your car with petrol for the weekly commute to work and some milk for the kids cereal from your local petrol station and just as you're about to pay for your purchases, a car smashes through the convenience store plowing into you and sending you to the hospital. Or imagine enjoying brunch with friends at your favourite cafe and you meet the same fate. What might surprise you is that low speed vehicle into building crashes are one of the largest overlooked safety issues in this country. 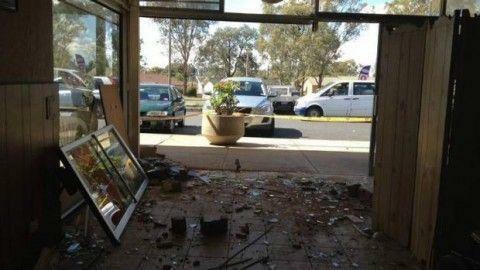 Should you wish to feel safe in businesses that offer nose-in shop front parking without protective devices, be careful where you choose to stand or sit, because there is a high chance that a driver-error accident could occur and cause you serious or fatal injury from the impact when the car smashes through the building. 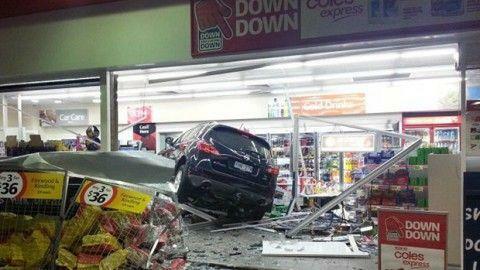 Oftentimes these accidental drive-through crashes are a result of the accelerator being pushed instead of the brake whilst entering or exiting the storefront parking space. Unfortunately, these types of pedal errors are occurring more frequently in Australia and without sufficient prevention methods in place, pedestrians and customers are unprotected against potentially dangerous out of control vehicle impacts. Most common is a driver pulling into the parking spaces in front and hitting the gas pedal instead of the brake. 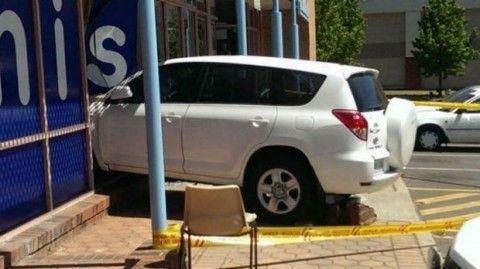 When this occurs, drivers pulling in fail to stop and, in fact, go over the sidewalk and into the front of the store. Second most common is a driver leaving the store, getting in his car to leave, and putting the transmission into "drive" instead of "reverse." Thinking he will move backwards, he usually looks back and hits the accelerator, driving the car forward — hitting the curb or the wheel stop. 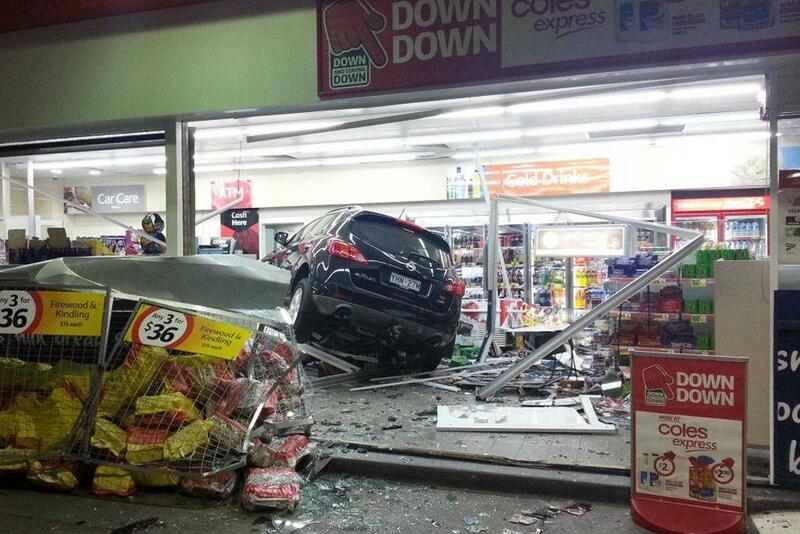 The driver's foot is then pushed HARDER into the accelerator and the car accelerates into the building. The results of either of these driver errors is the same — pedestrians hit on the sidewalk, damage to storefronts, and possible injuries to customers and employees inside the store. Installing protective devices, like bollards, stops slow-moving vehicles from mounting the sidewalk and smashing through the shop front, saving serious injury to customers and possible liability fees and repair costs. Steel or concrete bollards are commonly enforced after a driver error incident occurs. They are recommended by law enforcement authorities to prevent future repeat accidents by providing interference and lowering the risk of collisions with pedestrians, customers and storefronts. Bollards are typically steel posts that come out of the ground to provide asset and pedestrian protection in public places and industrial areas. They are commonly designed for permanent installation into a concrete or asphalt ground. Bollards can be used for a range of purposes and come in a variety of sizes, shapes and functions. They are generally supplied with a powder coated finish, but also come in galvanised or stainless steel versions. When it comes to purchasing bollards for storefront protection, it is vital that the bollards purpose is specified during the buying process, including where it is to be installed and what it is required to protect, to ensure that the supplied bollard/s are designed to withstand the force of predicted vehicle impacts. The importance of customer safety when entering and exiting petrol stations has been heightened over the last 12 months due to increased accidental drive-throughs to the storefronts of these businesses. Not only have pedestrians been seriously harmed but hefty fees in liability and property damage has also resulted from these crashes. It was brought to our attention that permanent bollards are insufficient protective devices at service stations due to staff and customer accessibility to the storefront merchandise. For this reason Barrier Group, in a response to a call from Coles Express, has developed a revolutionary range of semi-permanent bollards featuring a shallow embedment installation to avoid damage to buried services common to petrol stations. Linebacker bollards are suitable for installation at most businesses that offer drive-in storefront parking as they create an ideal safety barrier between the parking spot and shop front to keep pedestrians safe and assets protected from low speed vehicle impacts. A two-part defence system comprising of Linebacker bollards and Compliance wheel stops is recommended to ensure the highest level of pedestrian safety anywhere that provides parking spaces facing the storefront - including the sidewalk and/or shop front displays - like petrol stations, convenience stores, retail shops, supermarkets, shopping centres, restaurants, fast food chains and office or commercial buildings. Some buildings with storefront parking feature a narrow sidewalk (minimum 1.5 metres wide) between the parking spot and the front of the building which is the perfect setting for the installation of the Linebacker bollards and wheel stops. However, other businesses offer no space at all between the parking spot and the shop front, and in this instance, correctly installed Australian Standards compliant wheel stops would be recommended as a suitable solution. In each of the examples shown below, the results of these accidents could have been prevented had the above mentioned two-part protective device system been installed. If you can identify that there is potential for accidental storefront crashes at your business, you will agree that applying preventative measures against "pedal error" and other driver mishaps can ensure that your business - including your customers and employees - are not at risk. Barrier Group can help you reduce the likelihood of accidental storefront crashes from happening and reduce the risk to customer safety with our Linebacker Bollards and Compliance Wheel Stops. Don't leave it to chance - Now is the time to take action and get storefront protective devices installed at your business. Send us an email or phone 1300 55 33 20 to get started today.